Baby themed cookies are perfect additions to any babyshower, christening or naming day for both children and adults alike. Cakes by Robin can personalise any cookies with a message or name. Browse our gallery and get in touch to place your order. Baby Showers are a wonderful way to celebrate the imminent arrival of a baby surrounded by all those closest to you. 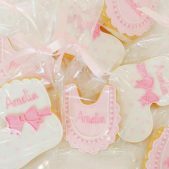 Whether you are planning a baby shower for yourself or you’ve been given the job of arranging a baby shower for a friend or relative, the addition of delicious, bespoke baby shower cookies will make a lovely celebration a special event to remember. Cakes by Robin are London cake designers known for their originality, creativity and dedication to deliciousness. Our team of expert bakers and decorators have many years’ experience in creating wedding cakes, birthday cakes and celebration cakes for any occasion. For your baby shower, our tasty, sugar decorated baby shower cookies are freshly baked to order, using the best possible ingredients to produce yummy results every time. Of course, we are able to cater for a variety of dietary requirements, including Gluten Free baby shower cookies, so no-one needs to feel they are missing out on account of a food allergy or intolerance. All our baby shower cookies are made and hand decorated just for you. Choose from an extensive range of adorable designs including baby bottles, baby footprints, baby rattles, rocking horses, bibs, baby grows, baby carriages, chicks and rubber duckies, rabbits or anything else you can think of. Cakes by Robin can personalise any cookie with a message or name of your choice. 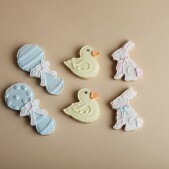 Why not browse our Baby Shower Cookies Gallery below? There is no tastier way to celebrate the arrival of your special little one than with baby shower cookies from Cakes by Robin. And if all that wasn’t enough choice for your baby event, we can also supply dainty Baby Cupcakes for both baby boys and baby girls for all types of celebrations. All our cakes, cookies and cupcakes are expertly created in our cake studio in South West London. We can deliver for free within the London area or you can come and collect your order. Please see our Cake Delivery page for full details.